I'm from Texas, and there are a lot of great people that came from that state. We gave you Beyoncé. We gave you Wendy Davis. But we also gave you our governor, and I am so sorry. In a pre-maybe-running-for-president flub, Gov. Rick Perry compared being gay to being an alcoholic Wednesday. Perry dropped by San Francisco's Commonweath Club of California after a poaching visit to Sacramento, where he was shamelessly wooing Tesla Motors to come to Texas. It was there that Perry drew that idiotic comparison after being asked if he thought being gay was a "disorder." Then, according to Reuters, he said this in front of a room full of people, which was also broadcast on a local CBS affiliate: "I may have the genetic coding that I'm inclined to be an alcoholic, but I have the desire not to do that. And I look at the homosexual issue in the same way." A few people in the audience gasped. No kidding. Dammit, Rick. You were supposed to be talking about energy independence! But as the poster child for the Texas GOP, which settled on a previously disproven, hard-nosed stance on "gay therapy" last week, it's wholly unsurprising that perry couldn't resist the proverbial gay carrot dangled in front of him. 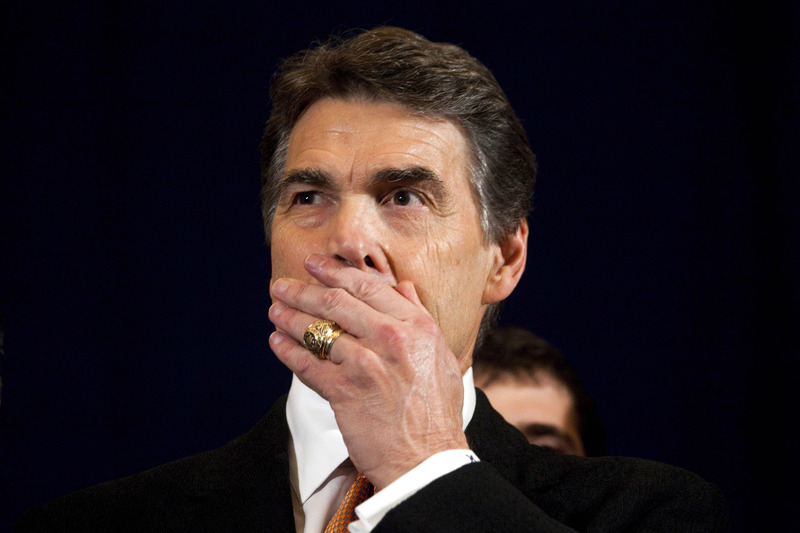 If Perry plans on vying for president, this isn't a good start to 2016. And believe me, he will. He gave up his throne at the Texas governor's mansion, where he has been seated since 2000, and he's not doing that to retire and run around shooting coyotes, or whatever he does in his spare time these days. Perry's disastrous 2012 presidential bid means that this time around, a lot of people will underestimate him. And on a national stage, I don't blame them. He was often incoherent in debates. He couldn't remember very simple facts. He tripped all over himself. He became the prolific King of Gaffes. As political writer Jay Root so beautifully put it, Perry's missteps became the "political equivalent of antibiotic-resistant bacteria," or the "Super-Gaffe." Really, Perry was best as Gov. Goodhair, the smiling, toothy Texas boy that looks just as comfortable traipsing around in a Ford F-350 as he does sitting behind a mahogany desk. And in Texas, that's kind of a benefit. During Perry's 14-year run, Texas' economy has been looking up: job creation, median income, insane growth. There was so much good under Perry's watch — minus, you know, that stance on gay rights — that it was referred to as the "Texas miracle." Now, is it really a miracle? Probably not. And does it have anything to do with Perry being in office? Again, probably not. But it doesn't matter, because he gets to tout that again and again for Texas voters, which kept them coming back. After Perry took his seat, he was able to handily defeat any challengers from his own party. And the Democrats? In Texas, where Republicans hold super-majority in both the House and the Senate, the blue candidate for governor is usually just for show (sorry, Wendy). Perry doesn't have his storied reputation on the national stage (yet), so he can't rely on his résumé. And while I honestly wouldn't wish a Perry White House on my worst enemy, he could feasibly be a viable candidate.